Subject to correction, the product was first added on 2014-01-29 09:21:28 and the last date we have for this product is 2017-06-22 10:39:46, where the last unit was sold for R 1640, which may have been a final clearance price. 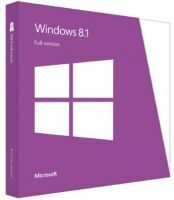 Microsoft Windows 8.1 Single Language Edition - DSP Software, DVD Pack - 64Bit Desktop License Copyright © 2019 ComXpert International CC - COPYING IS ONLY ALLOWED FOR THE PURPOSE OF SENDING US ENQUIRIES. E&OE. our lock screen displays a slide show of your favorite photos. Plus, you can answer Skype calls, and take photos before you even unlock your PC. Bing smart search gives you results from your PC, your apps, and the web. Results are in a clean, graphic view so you can quickly get to what you're looking for. It goes where you go. Use your Microsoft account to sign in to any of your devices running Windows 8.1, and you'll see the same layout, apps, and settings. Signing in with your Microsoft Account (which is simply an email address and password of your choice) also gives you access to a world of apps from the Windows Store, and lets you save, view, and edit your documents and photos online with SkyDrive. SkyDrive is free online storage that's built into Windows 8.1. Save documents, photos, and other files to SkyDrive automatically, and get to them anytime, from any of your PCs or devices. And you can use SkyDrive to protect your files if something happens to your PC. Internet Explorer 11 is built for touch—now with larger tabs, simpler controls, and fluid response to gestures. Internet Explorer harnesses the power of hardware acceleration, so sites load faster and browsing’s smoother. The always-on app that makes staying in touch with all your contacts easier than ever. Keep in touch with video and voice calls and instant messaging, all from one app. Call any phone quickly and easily. All Skype-to-Skype video and voice calls are free, and your messages are delivered straight to you no matter what you're doing. Snap Skype left or right and do more while you IM, video call, or keep an eye on your home screen. Open the Windows Store right from your Start screen to browse and download apps for cooking, photos, sports, news, and a lot more—many of them free. Sort by price, rating, and category. Find old favorites and hot new apps. Mail - Get email from your accounts—including Outlook and Yahoo!—all in one place. Music - Explore, download, and listen to the latest music. Videos - Browse and watch movies and shows. Watch on your PC or play to your TV. Photos - Photo editing for touchscreens, the way it's supposed to be. Crop, fix, and apply filters quickly and easily. Games - Discover the hottest new games, classic favorites, and exclusives for Windows. Track your progress and compare scores with friends. Camera - Take photos and videos, browse through them, and share the best ones with your friends and family. People - Stay connected and start conversations with contacts from your social networks and email accounts. Maps - Quickly pinpoint, save, and explore the locations you care about. Get driving directions and see traffic conditions. Calendar - Keep track of your schedule in month, week, or two-day view. Get appointment reminders so you’re always on time. Finance - Comprehensive financial news and market data from the global sources you trust. Alarms - Set up and customize multiple alarms for all the things you need to be reminded of. Turn them off when you want to focus. Calculator - A reliable classic, still there for you, and now optimized for touch. Food + Drink - Get thousands of recipes, instructional videos, and tips from renowned chefs. Sound Recorder - Easily record a sound, and then trim, save, and replay it on your PC. Reading List - Save stuff you're interested in to read later, or share it with friends. Windows 8.1 was designed to power an exciting and affordable new generation of PCs. You'll be amazed by what a computer can do now. The best price and guaranteed service and backup from official computer suppliers in South Africa for the DSP-WIN8.1-SL64 Microsoft Windows 8.1 Single Language 64bit. Find related DSP-WIN8.1-SL64 Microsoft Windows 8.1 Single Language 64bit products in our Desktop Operating Systems - OEM / DSP Category for even more options. Read reviews and find out about DSP-WIN8.1-SL64 Microsoft Windows 8.1 Single Language 64bit. Discounts, specials and cheap prices only at ComX Computers.